Trayvion White-Austin (Sahuaro, Sr.) is the returning State Champion for D2 Boys' Long Jump. Now that Desert Mountain has been reclassified as a Division 2 school, Armand Reichelt (Sr.) the top returner in the State will contend with Austin for the D2 Boy's State Title. Jake Treptow (Campo Verde, Sr.) will enter the season as the top returning Triple Jumper and for the D2 High Jump there are seven guys who have cleared 6-feet 2 inches. Which of them will take the victory come May? 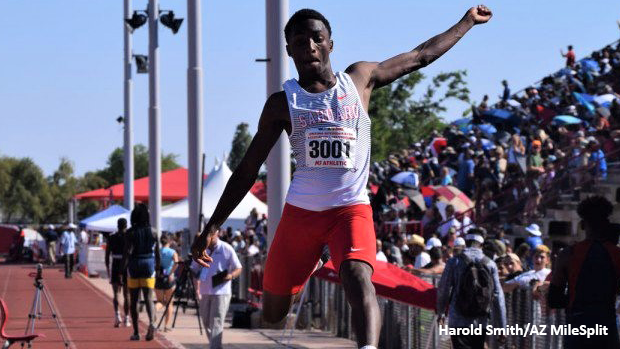 Check out our full lists of the Top 100 Returning D2 Boy Jumpers in each event.